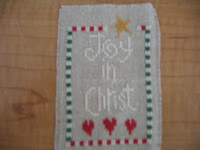 This month I selected Lizzie Kate's freebie ornament Joy which I modified by adding the words"in Christ" and adding enough space to accommodate the larger message. 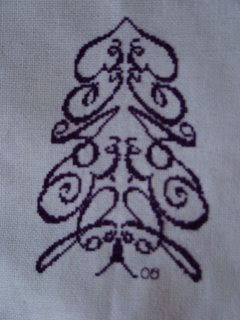 It is stitched on 28 count natural opalescent linen with DMC floss. This was fun to stitch and I will finish it by top stitching onto green felt and fraying the edges. Here are a couple of ornaments I have completed and wanted to share them. Here is M Designs from the JCS Ornament magazine,I have yet to add the beads and it will be for my daughter Amanda who decided she needed more "Grown Up" ornaments. The second is from Gloria and Pat "Precious Moments" My youngest who is into ballet big time begged me to make this for her. 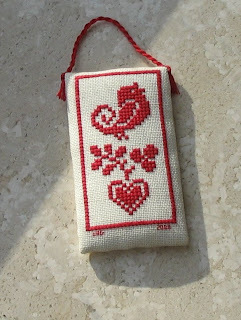 "Easter Bonnet Duck Ornament" from the April 2008 "The Cross Stitcher" This cutie is stitched on mystery cloth with mystery threads as I attempt to use some more of my stash before adding anything more to it! The April Freebies are up! This month's themes are Angels, Churches / Religious, Decorations and Holly. As always, you're not obligated to stitch these themes or patterns - they're just provided as a suggestion*. The April Stitchers of the Month will be posted on April 1st. Only stitchers with active blogs or photo albums will be featured. I occasionally check the blogs and albums of our contributors and remove any that have not been updated in at least the last 4 months. The blogs and albums are not requirements of membership, but they are a nice way to get to know your fellow stitchers, and those interested in checking out the blogs should have access to ones that are at least somewhat current. If you forget to label, you can always go back in and edit your own posts. If you have trouble doing this, please contact me and I'll be glad to help you out. For March, I did a sheep ornament. 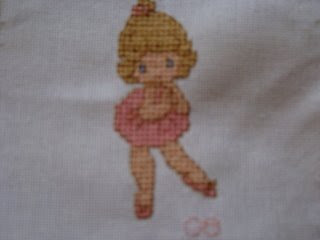 I stitched part of a free chart from Barbara Ana that I found on CyberStitchers and changed it a little. It's kind of hard to see the white sheep but they are there. 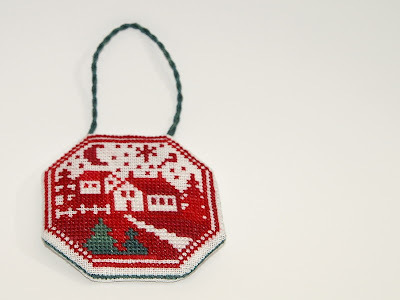 I missed stitching an ornament in February. I am hoping to have a month in which I can stitch two. 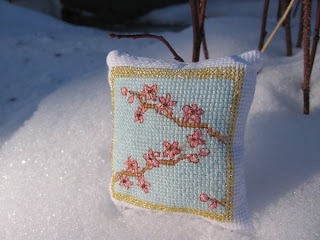 Labels: Chatelaine Designs, Christine R.
The first ornament is really not a traditional pattern for Christmas but an ornament reminding me of the beauty of Cherry blossoms we never have here. It reminds me of my son just now living outside Tokyo. I have seen them once in Stockholm. I hope Christmas 2008 is going to have some ornaments in lighter colours too. Hi all! I just completed my March ornie. I love this little mouse, and he is enjoying building this snowman. I was going to use one of my homemade carrot noses, but it was too large. I may also save this design for a card instead of an ornament. lol decisions, decisions! Happy Easter to all. This weekend, March 22 & 23, is our monthly stitch-a-long. I know many people will be celebrating Easter this weekend, so it might be a little more difficult than usual to find the time. If you are stitching this weekend and still don't know what you're working on, take a look at the long list of freebies posted on the right for tons of great ideas. 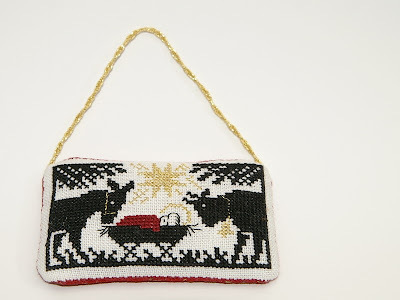 This is Cherished Stitches' Colonial Christmas Ornament from the 2007 JCS ornament edition. It's a three-sided ornament and I finished it off with ribbon and a bell. I have finished my March ornament & card. 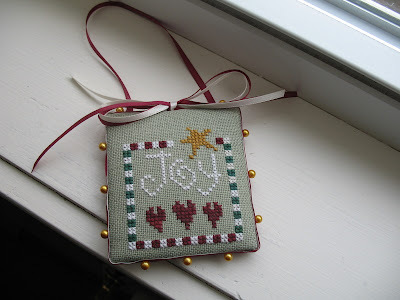 The ornie is from the 2001 JCS Christmas Ornaments magazine by Elizabeth's designs. Stitched on 28 count Jobelan using WDW 'Angel Hair' for the sheep and DMC Threads. I changed the colour of the 'snow' the sheep is standing on, in the pattern to green, as it does not snow at Christmas in Australia. The card is a freebie I found on the net somewhere. Stitched on 25 count evenweave with DMC Threads. This is fun Jennifer, thanks for the SAL. This is my own compostition for someone I know who loves music. ... ornaments (february and march). 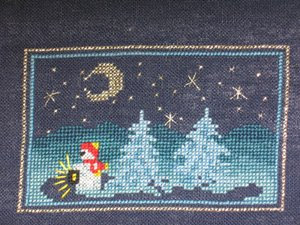 Designs: Cranberry Christmas and Starry night (The Prairie Schooler). I used Caron-Threads for the first, Anchor and Madeira for the second. I returned to my old blog . Jennifer, would you be so kind to change the link to my blog in the linklist?! Thank you very much. This is my February ornament. 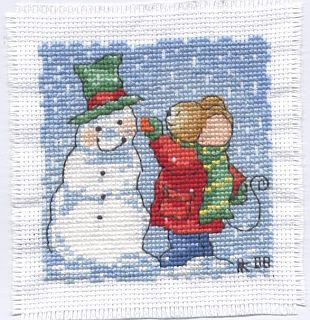 It's yet another cute freebie from Emily at The Floss Box. 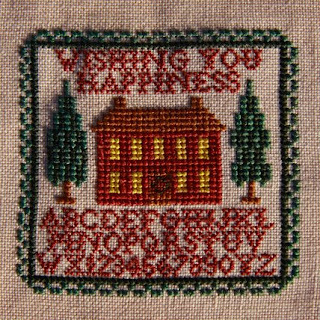 I decided to stitch it because I like anything with a house in it. I didn't use all of her suggested colors and I think my ornament turned out a little too brown. You can find the chart here. Thanks for all your inspiring ornaments. 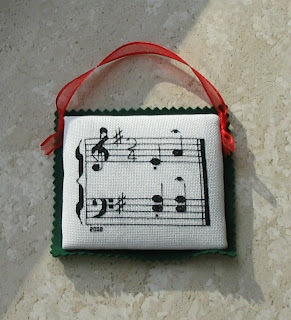 And I've stitched some ornaments too, will try to get those posted soon!